The finalists for the 53rd Nikon Walkley Photographic Awards have been decided, and as usual the sheer beauty, breathtaking, action-packed and emotional talent has not let the competition down. There are some seriously amazing photographs this year. 1. Image from Glen Campbell's series The Funeral of Alfredo Reinado. 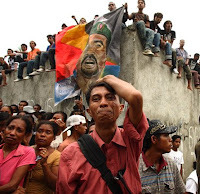 When news broke of rebel leader Alfredo Reinado's death, CAmpbell travelled from a remote area near Alice Springs to Dilli to photograph the funeral. 2. Image from Glen Campbell's series The Funeral of Alfredo Reinado. Friends and supporters of Alfredo Reinado gather to prepare his body for burial. 3. Image from Steven Siewert's series on World Youth Day. Catholic pilgrims pose with a cardboard cut-out of the Pope. 4. Image from Steven Siewert's series on World Youth Day. Actors recreate the Stations of the Cross in Sydney. 5. Stephen Dupont's image titled Afghanistan: A Suicide Bombing. Dupont was injured by shrapnel when he was caught up in this suicide attack. He was on his way to witness police destroying poppy fields in Khogyani, eastern Afghanistan. 6. Dallas Kilponen's image titled Pyrmont Shooting. A police forensics officer examines a handgun under torchlight that was believed to have been used in a shooting in May 2008. 7. Michael Keating's shot titled Kicked Out. Keating was staking out Melbourne's CBD during the debate about the merits of imposing a 2am curfew to curb alcohol-fuelled violence. The image was taken at 4.15am when two strip-club bouncers ran into a crowd of men began attacking them. This photo has been commended by judges but is not a competing finalist. 8. Image from Andy Drewitt's series titled Breakdown. Former car mechanic and male model Stuart Evans, aged 54, has battled schizophrenia for 32 years. This set of images won Drewitt this year's prize for best community / regional photography. 9. Image from Andy Drewitt's series titled Breakdown. Drewitt spent the two day photographing Stuart Evans, who at aged 54 has battled schizophrenia for 32 years. This set of images won Drewitt this year's prize for best community / regional photography. 10. Image from his India's IPL Fans series. Greenhill was assigned to cover the first ever Indian Premier League Twenty20 cricket games. Cricket fans watch the Washington Redskins NFL cheerleading squad show off their moves ahead of the game. 11. Craig Greenhill image from his India's IPL Fans series. Greenhill was assigned to cover the first ever Indian Premier League Twenty20 cricket competition. Fans pack into the 120,00 capacity Eden Garden stadium in Kolkata. Most of the fans are penned in behind 3m high barbed-wire fences. 12. Image from Lisa Wiltse's nominated set titled The Boarding House. The 38 intellectually disabled residents of Wallerawang, in the Blue Mountains, are fully intergrated into the town's community. Wiltse states that it is the people that dominate this series with their "quiet joys and sorrows, their fierce independence, and above all, their dignity". 13. An image from the Wallerawang series titled The Boarding House by photographer Lisa Wiltse. Wiltse's images focus on a community of 38 people suffering from various intellectual disabilities. 14. Sydney photographer John Reid's image titled December Storm. Reid's camera was on hand to capture city commuters as they were caught in a freak thunderstorm that drenched Sydney's CBD. This photo has been commended by judges but is not a competing finalist. 15. A shot from Phil Hillyard's collection titled The Best of the Best. Jamican superstar runner Usain Bolt raises his hands in celebration as he smashes the world record for the Men's 200m at the Beijing Olympics. 16. A shot from Phil Hillyard's collection titled The Best of the Best. Greg Inglis of the Melbourne Storm dives to score a try as his side closes in on victory in the 2007 NRL Grand Final. 17. A shot from Craig Golding's collection Australian Aquatic. Competitors at the start of the annual Shark Island Ocean Swim. 18. A shot from Craig Golding's collection Australian Aquatic. World champion Brett New performs an inverted jump at the Australian National Barefoot Waterskiing Championships. 19. An image from Ezra Shaw's series titled The Dive. Canadian swimmer Emilie Heymans competes in the Women's 10m Platform final at the Beijing Olympics. 20. An image from Ezra Shaw's series titled The Dive. A swimmer in full flight as he dives into the Icebergs Pool at Bondi. 21. An image from Brendan Esposito's series Blind Love. 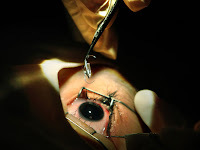 A life-changing operation performed at the Phu Yen Province Eye Hospital in Vietnam. 22. An image from Brendan Esposito's series Blind Love. 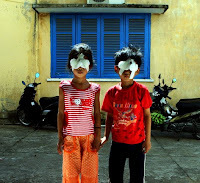 Life-changing operations at the Phu Yen Province Eye Hospital in Vietnam. 23. A shot from Steven Siewert's series titled Rockabilly: Living in the 50s. Jonno poses as he takes a break as best man at a Rockabilly wedding. 24. A shot from Steven Siewert's series titled Rockabilly: Living in the 50s. Rockabilly's take the dance floor by storm at Greazefest, an annual event held in Brisbane. 25. An image from Tamara Voninski's series titled The Last Kingdon. Voninski's images were set against the backdrop of the coronation of the New King of Tonga. In this picture a school teacher leads a parade to celebrate the Kings's birthday. 26. An image from Tamara Voninski's series entitled The Last Kingdon. Voninski's images surrounding the coronation of the new King of Tonga aim to paint a different picture of Polynesian life. In this shot a man jumps off a ship wreck to go for a Sunday morning swim. Swimming is illigal on Sunday in Tonga. 27. 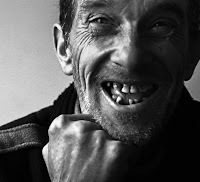 An image from Stephen Dupont's portfolio. Dupont captures troops filing past a plaque remembering British soldiers who have died in the Afghanistan war. 28. David Gray's shot of US swimming sensation Michael Phelps celebrating his team's 4x100m relay victory at the Beijing Olympics. 29. David Gray's shot from the Sichuan earthquake shows the parents of a dead child mourning over her body. 30. Sports photographer Phil Hillyard gets a nomination for the top spot. Controversial Indian spinner Harbhajan Singh celebrates his wicket against Kumar Sangakkara during a One-Day international match. 31. Sports photographer Phil Hillyard gets a nomination for the top spot. US swimming star Michael Phelps drives through the pool to secure victory in his 200m Butterfly Semifinal at the Beijing Olympics. 32. Jennifer Eliot's shot titled Milliseconds Before Impact. Eliot's shot captures an unseated rider at this year's Mount Garnet Rodeo. This photo has been commended by judges but is not a competing finalist. This years prize has been won by Andy Drewitt, for his series titled Breakdown. 33. This image, titled Waiting for Wanda Jackson, by Steven Siewert, was voted this year's winner in the photographic portrait category. The picture is part of a larger essay taken over the past five years which examines Sydney's Rockabilly scene. Robyn waits in her boyfriend's car for Wanda Jackson, a star who once dated Elvis.